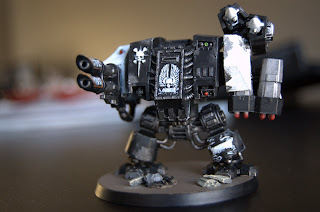 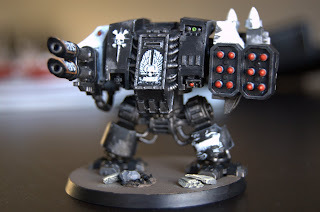 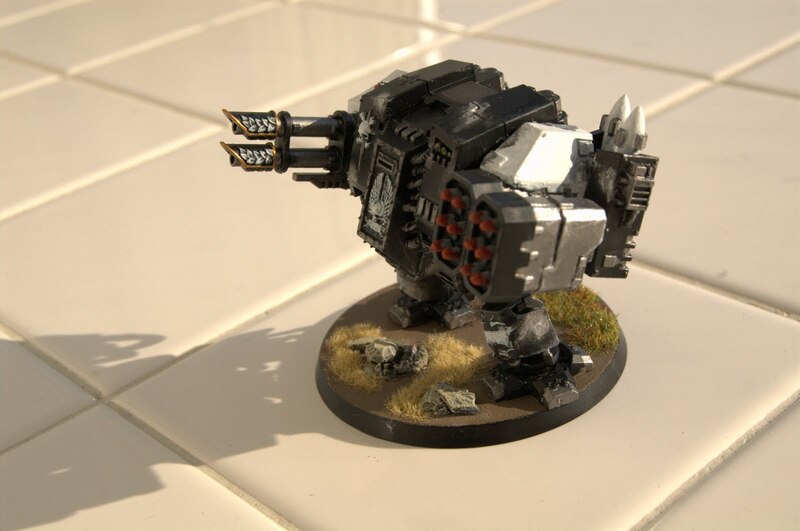 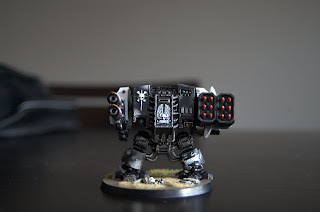 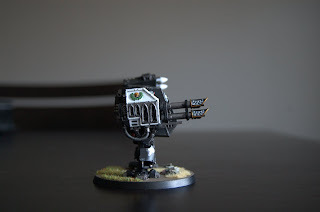 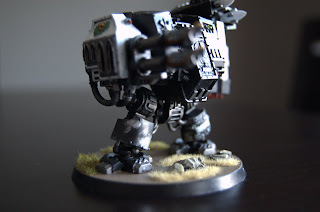 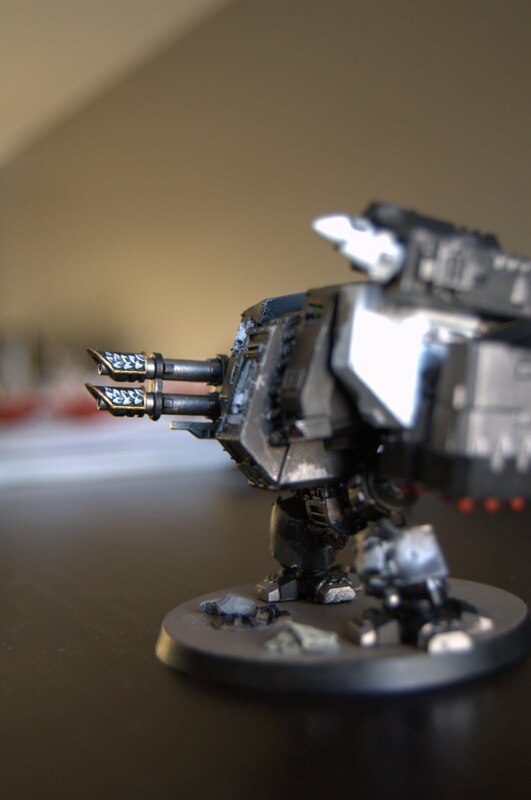 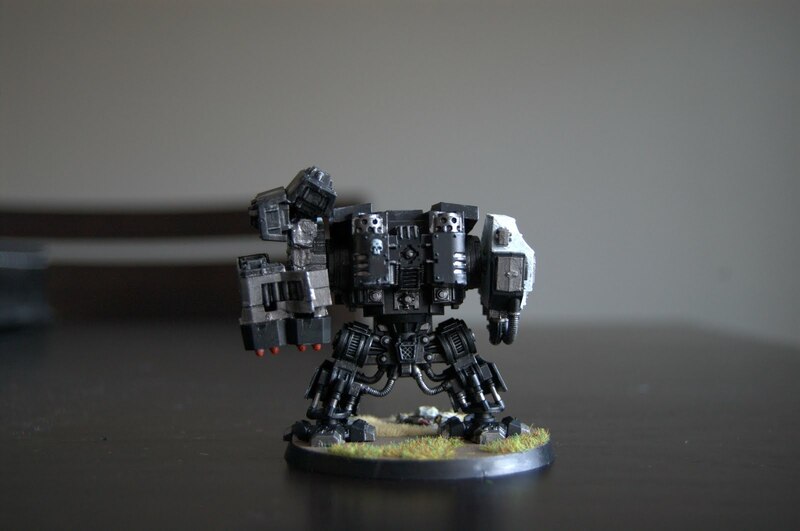 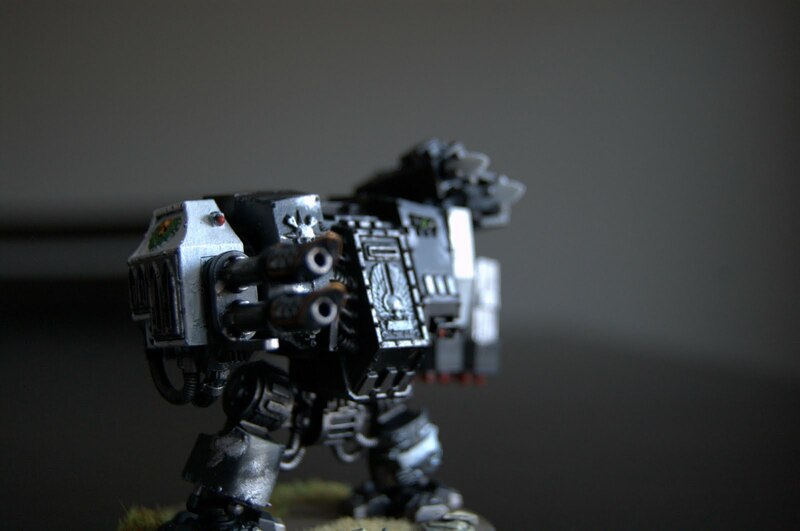 I finally finished this shooty Raven Guard Dreadnought, equipped with twin-linked lascannon & missile launcher. This one took a little longer, admittedly, because I broke my own rule of not sticking to one unit at a time. 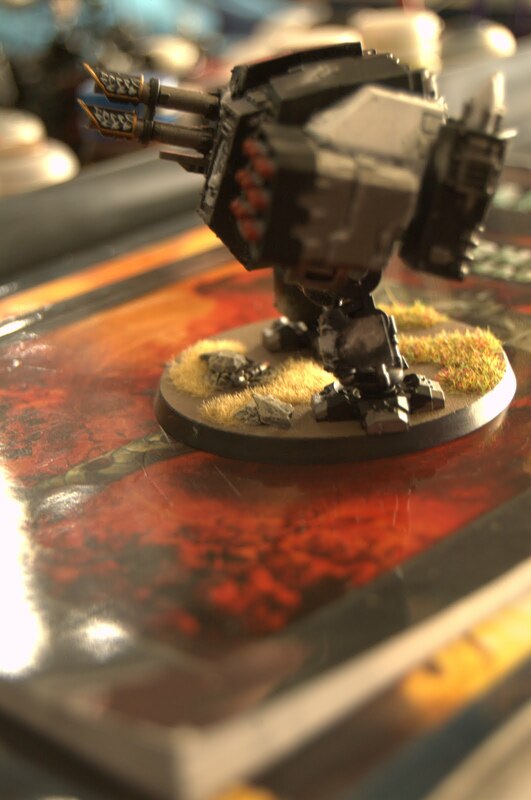 I was distracted by some upcoming projects while I was deciding how to do the dreadnought base. 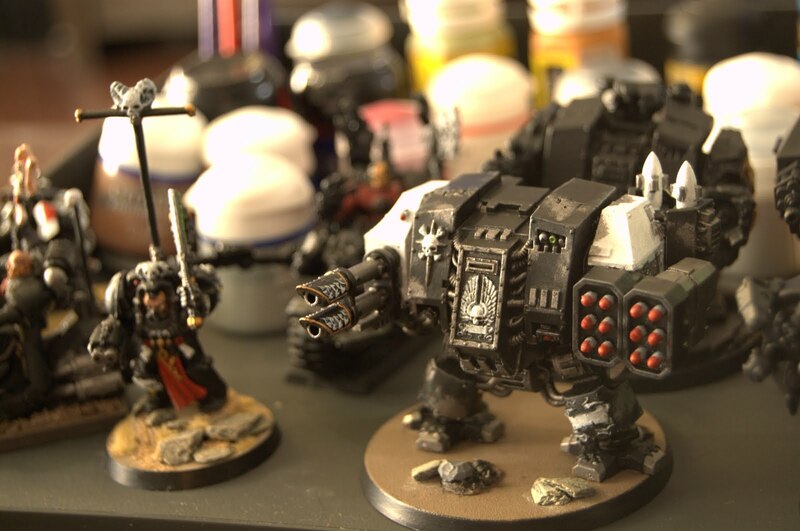 I started prepping the next 3 dreadnoughts and tried to master the art of dotting eyes on the models with exposed faces/skin. I have a couple more techniques to try out but I hope to yield better results in the near future with a little more practice. One of these "flesh" models is an old Space Marine Chaplain on Bike (far left) that I've started to repaint to match the Raven Guard color scheme. 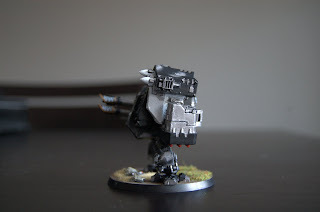 I should have some more on this guy posted soon. Back to the dreadnought, I knew I wanted to incorporate some stones, ruble, maybe a missile or loose ammo casings, etc. on the base to give a more dynamic feel to the model -- this dreadnought was built from the body of the one included in the Assault on Black Reach (AoBR) 40k box set with the lascannon arm coming from a Venerable dreadnought sprue, and the missile launcher arm which was scratch built from spare Land Speeder Typhoon and hunter-killer missile bits. 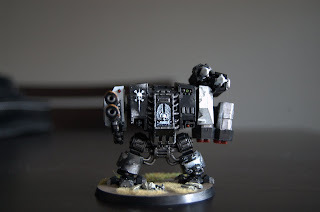 I wanted to outfit at least one of my dreadnoughts for long-range armour busting & fire support since the other 5 dreadnoughts in my army are equipped for other tactical and strategic scenarios. 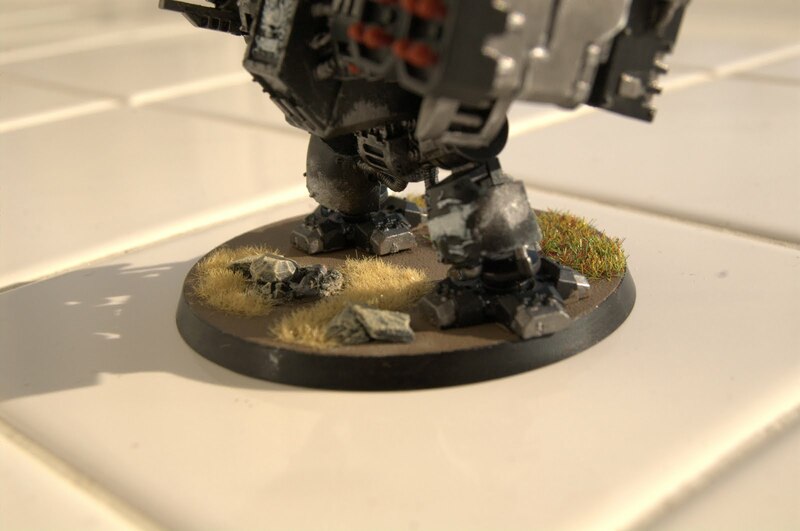 Since this dude will probably be hugging cover on the board to avoid being blown up on turn 1, I wanted to highlight the potential nearby foliage / terrain with some green grass on the dread's base. I picked up a canister of Citadel's Scorched Grass at the same time I bought the Dead Grass for the bases with the intent of putting this on my Scouts, snipers, and other models that are more likely to be in cover during the game. 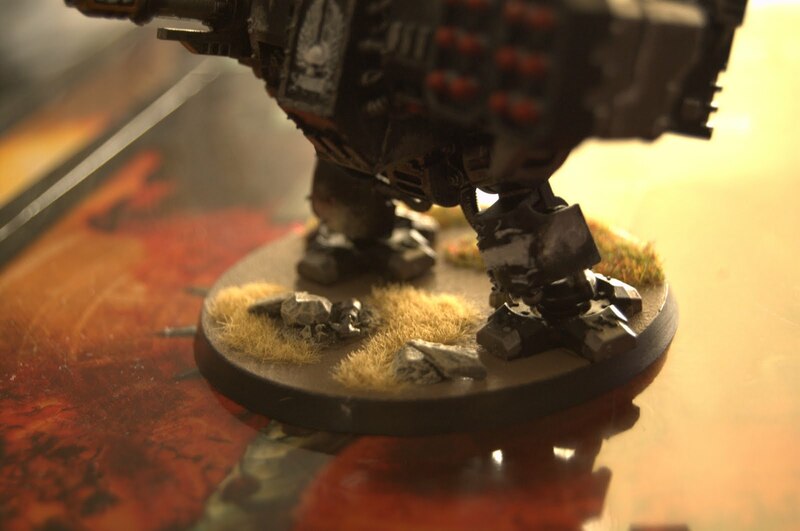 This also introduces some more color into the palette and adds variety to bases of the models in the army. 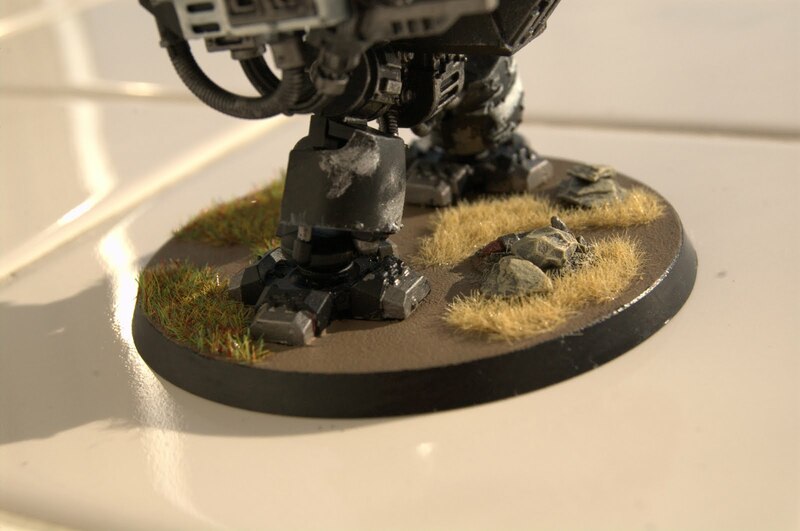 I used some resin material and bits from a basing kit with dead grass on the front portion of the base and green / scorched grass on the back half. Overall, I'm really happy with how this one turned out. 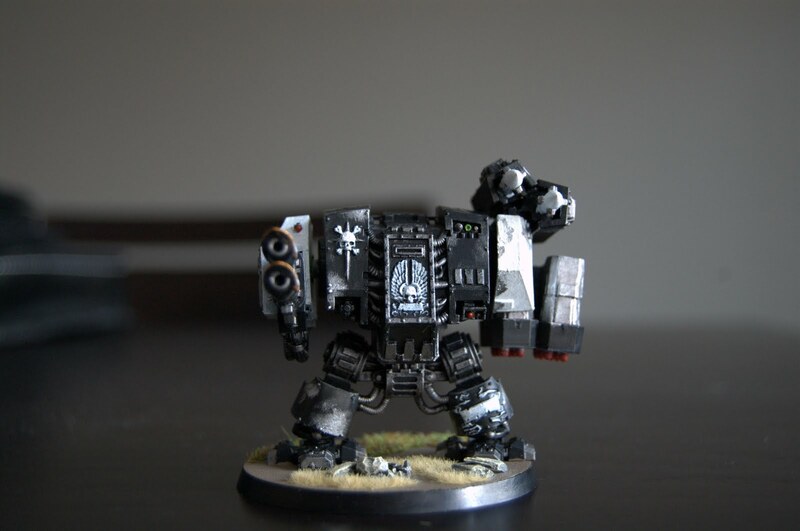 Looking forward to having the rest of the dreadnoughts painted up and on the tabletop soon. You can view more of the most recent dreadnought shots here, and all of the shots taken earlier during the painting process here.